The Vikings watched New England and Miami have success by running against the Bears defense. So why did Dalvin Cook gain only 14 yards and Latavius Murray only 4? Before the Bears had embarked on the three-game win streak that allowed them to enter Sunday’s game with the Vikings atop the NFC North standings, they’d lost a pair of games in which their opponents — the Dolphins and Patriots — had been able to establish a run game against the NFL’s second-ranked rushing defense. The Dolphins gained 161 yards on the ground in a 31-28 overtime win on Oct. 14, before the Patriots put together an efficient complement to Tom Brady, running for 108 yards on 27 carries in New England’s 38-31 win on Oct. 21. That approach certainly figured to be on the Vikings’ minds last week, as they prepared for a Bears defense that presented something of a catch-22: Chicago’s 31 sacks were one behind the league lead the Vikings shared with four other teams headed into Week 11, and the Bears had created 89 points off turnovers in part by picking off 14 passes after their pass rush had been able to create problems for opposing quarterbacks. The Vikings came into Sunday night’s game looking to establish the run, handing off to Dalvin Cook and Latavius Murray on eight of their first 13 offensive plays in the game’s first two series. But the Vikings’ inability to find much of a foothold, and the 14-point lead the Bears built in the game’s first two quarters, meant whatever designs the Vikings had on running the ball against Chicago quickly fell by the wayside. Minnesota finished the night with just 14 rushing attempts for 22 yards, with Cook gaining 13 yards on nine carries and Murray posting five yards on four carries. After running on eight of their first 13 plays, the Vikings called runs on just five of their next 54, with Kirk Cousins adding a five-yard scramble late in the fourth quarter with the Vikings down 11. 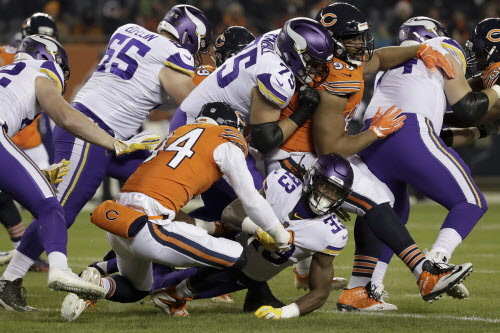 Unable to assert itself against a stout Bears front led by defensive end Akiem Hicks — whose five tackles for loss gave him eight against the Vikings in the last two games at Soldier Field — Minnesota was forced to try and string together long drives against Chicago’s two deep safeties, without the help of both downfield strikes and a consistent counterweight to its passing game. Cook appeared to gain a first down on his first carry of the game on 2nd-and-2, but officials marked him short of the line to gain after his hand hit the ground when Leonard Floyd brought him down. Then, Hicks drove right tackle Brian O’Neill into the Vikings’ backfield, setting up a tackle of Murray for a one-yard loss on third down to end the Vikings’ first series. Their second drive saw the Vikings’ three most efficient runs of the night, when Cousins made checks at the line of scrimmage on a pair of Cook handoffs that went for seven and six yards, before tight end Tyler Conklin’s trap block walled off Hicks on Latavius Murray’s six-yard gain. But Mack stripped the ball from Cook to end the Vikings’ second drive at the Bears’ 14. The Packers defensive front they’ll see on Sunday night could be at less than full strength, with tackle Mike Daniels expected to be out for several weeks with a foot injury and Kenny Clark also dealing with an injury that sidelined him for part of the team’s loss to the Seahawks on Thursday night. Green Bay is ranked just 26th in the league against the run, so the Packers game might present the Vikings with opportunities to re-establish the kind of balance they enjoyed in a 24-9 win over the Lions, when they ran for 128 yards. But whether because of mismatches up front or the circumstances of the game, the Vikings’ hopes of establishing their 31st-ranked run game against the league’s second-best run defense quickly had to be scuttled, which probably meant they were going to be in for a long night.